Overall Prints Size: 34" X 25"
The final limited edition in Robert Taylor's Protagonists Series. 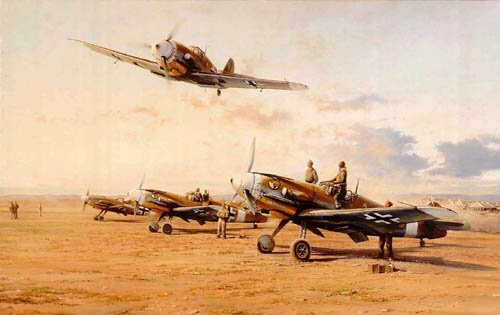 Robert Taylor's painting records Hans-Joachim Marseille's jubliant low pass as he returns to his Desert airstrip having just achieved his 100th victory. In the foreground his fellow pilots are seen clambering out of their Me109's having just completed another successful mission. FOUR distinguished Luftwaffe fighter pilots.